annnnnnnnd I’m back. Wow. What an experience that was. 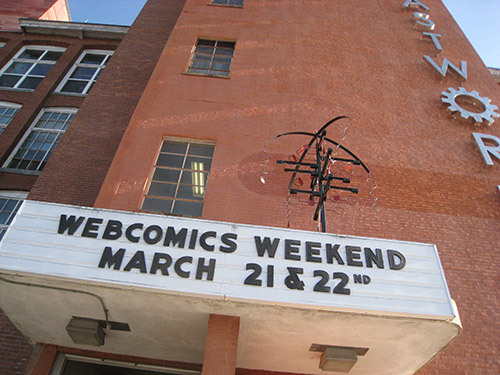 I highly recommend if you’re are at all serious about webcomics, as a fan or as a creator, GO to Webcomics Weekend… as it does seem like this may be a yearly event! It may not be in at this place or even in the New England area, but… GO. One big pep rally for WEBcomics. My Posse for the event were fellow webcartoonists: Chuck Egan (Surviving Retail), Carlisle â€œCJâ€ Devonish (Steal This Comic), TL (Bullfinch, Superfogeys Origins), and my new witty blogger girl-pal, Casey Conan (Bargeek). Now, go and check their stuff out! So, it basically was kind of a convention after all. Minus a lot of of the crazy costumes, extra long lines, and non-comics merch-overload that usually deters me from going to conventions. I met a lot of these pros, with lives I covet: making a living off of their comic. Amazing, it is possible. The panels were a tad disappointing, honestly (except for the webcomics weekly podcast, which was hilarious! ), but I think I managed to wrangle some tips and info out of them. All in all, a cool experience. So, follow your buddies! They should be entertaining. I’ve already conversed with them personally. Because I’m a dork. You should probably already know that I, myself, am also on twitter.. right here. Off to webcomics weekend! See you all next Tuesday, I hope.